Welcome to another month of #FoodieExtravaganza! This month we are highlighting the ingredient: PEANUTS and our host is the lovely Alexis from We Like To Learn As We Go! I love all things peanuts - peanut butter in particular. I think I almost ate my weight in PB and J sandwiches when I was pregnant with the twins (ok, not quite that much - but a half sandwich was often my "go-to" bedtime snack along with a small glass of milk, and I never got tired of them!) If you would like to participate in the next Foodie Extravaganza, just go to the Facebook page to join. We would love to have you! When I learned we were cooking with peanuts this month, I did a quick Pinterest search for inspiration and these amazing looking and sounding Reese's Cheesecake Brownies hit my radar. I was sold. I have had this recipe saved in a draft for nearly a month, begging to be created! Ok, I am digressing... a lot. You want to see creamy, peanut butter, chocolaty goodness! And this recipe absolutely delivers all of that and more. I used my new favorite kitchen tool to blend the brownie batter together. The brownie batter gets a generous helping of chopped mini Reese's and then poured into a 9x13 pan lined with Reynold's nonstick foil. The peanut butter cheesecake layer is whipped until light and fluffy, and gently spread over the brownie batter. This beautiful concoction is baked for 35 - 40 minutes, until set, then refrigerated for an hour until cooled through. A generous layer of melted chocolate is smoothed over the baked cheesecake and more delicious morsels of mini Reese's are distributed over the warm chocolate - then back to the refrigerator to chill just one last time so the chocolate layer can set up. These are VERY rich - make sure you have a glass of cold milk to wash them down, and cut the pieces small. They are SERIOUS chocolate fix deliciousness! The brownie layer is very rich and fudgy, the cream cheese layer is creamy and peanut buttery - and this is an amazing combination of the two flavors and lots of textures that complement each other for an incredible sweet tooth fix. These were a huge, huge hit in my house - my husband and son were practically swooning. They each downed 2 (fairly large) pieces the very first night we cut into these, which is always a sure sign of praise and approval from my recipe critics! Of course, I guessed these would be a big hit with them both since they are both huge Reese's lovers and fanatics - it's an oversized, soft, creamier, fudgier version of a Reese's, how could I go wrong?! We have a great variety of yummy recipes from main dishes to desserts to share with you. 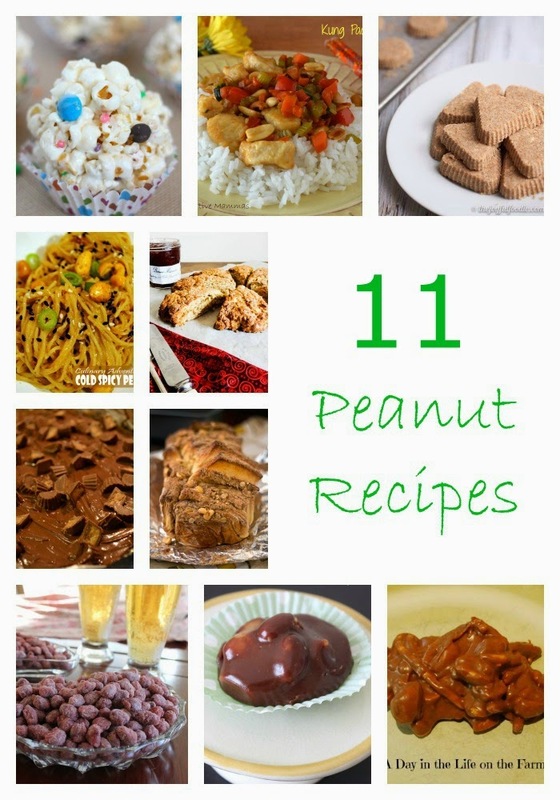 Here are 11 delicious Peanut Recipes! Preheat your oven to 350 degrees. Line a 9x13" pan with Reynold's nonstick foil for easy removal of the bars. Chop your Reese's peanut butter cups in half, then divide the Reese's into 2 piles. In a medium sized nonstick pot, melt the ¾ cup of butter with the chopped dark chocolate. Stirring constantly until the chocolate has melted, keep the heat to medium-low so you don't burn the chocolate. Remove from heat. Whisk the sugar and brown sugar into the butter / chocolate mixture. Whisk in the vanilla and 3 eggs, when those are incorporated, whisk in the flour. Gently stir in half of the chopped mini Reese's Peanut Butter Cups. Spread the brownie batter in the prepped 9x13" pan. In the bowl of a stand mixer fitted with the paddle attachment, whip together the cream cheese and softened butter for about 2 minutes until fluffy. Add in the egg, sugar, salt, and vanilla and continue to blend on high for about 2 more minutes. Finally, add in the peanut butter and blend on high for 2 more minutes (scrape down the sides as needed - mixture should be smooth and fluffy). Gently spread the cream cheese layer over the brownie layer until it is smooth and completely covers the brownie layer. Bake in the preheated oven for 35-40 minutes, or until the top and edges are lightly golden brown and the center is set. Allow the bars to completely cool (I let mine sit out on a wire rack for about an hour) and then refrigerate for at least an hour before proceeding with the final chocolate layer. To make the chocolate layer: In a medium nonstick pot over medium-low heat melt the chocolate chips, stirring constantly with a spatula (if you want even more of a peanut buttery taste, add a TBS of peanut butter to the chocolate chips while melting). When the chips have melted and are smooth, quickly and carefully smooth the melted chocolate evenly over the top of the cooled cheesecake layer, spreading evenly until it covers the entire pan. Sprinkle the remaining chopped mini Reese's Peanut Butter Cups on top of the chocolate while it's still wet. Return the bars to the refrigerator until the chocolate is set. Cut into squares and serve. Store leftovers, covered, in the refrigerator. These look delicious! I know my family will love these! I hope you try them Alexis - they are pretty over the top! Wow these look wonderful Rebekah....nothing beats chocolate and peanut butter! Reese's peanut butter cups are my favourite chocolate bar, we don't get them that much over here in the UK and when we do they are so pricey. How I wish I could reach through the screen and grab a couple. Laura, I'll mail you a box (of Reese's - not the bars, don't think they'd make the trip...)!! Fabulous brownies, Rebekah! Cheesecake and Reese's peanut butter cups in a brownie are the best. These look outrageously delicious, Rebekah! I think they would be devoured in a split second in our household. Thanks for sharing. These sound so amazingly rich - like the perfect nighttime indulgence with a cold glass of milk or some black coffee. I bet my family would inhale them! This looks and sounds like I'd have to exercise for a week to work off the calories. It looks delicious. Reese's is my favorite American candy bar. I take them with me when I travel out of the country because most other places don't have them. Oh my, you had me at Reese's! This looks amazing, and is definitely going on my "got to make" list. I'm sorry. These words were a bit hard to read because I kept scrolling back to look at the brownies! I need some brownies immediately! These look delicious.